Imagine you are a student of classical music, and discovering in your sophomore year that you attend the same school that trained Mozart. Or imagine you are a student of art, and learning that the very school that is shaping your talent, once helped to shape the talent of Picasso. Now you can understand what it is like to be a student of neuroscience, who has just learned that she is studying at the same college that helped shape the mind of Patricia Goldman-Rakic. Patricia and her twin sister Ruth both graduated from Vassar in 1959. After Vassar, she earned her doctorate in neuropsychology from the University of California at Los Angeles, and later went on to a post-doctoral appointment at the Museum of Natural History in New York City. In 1965 she was offered a fellowship at the National Institute of Mental Health, where, quite contradictory to what the rest of the neuroscientific community was doing, she began working on unraveling the mysteries of the frontal and prefrontal cortices. Among her many accomplishments, Goldman-Rakic was responsible for mapping the prefrontal cortex, which is essential for the higher level processing of motor control, and for planning and executing complex behaviors, especially those which require the use of an integrative working memory mechanism. The prefrontal cortex accounts for about half of the entire frontal lobes in humans, and almost all other cortical and subcortical areas influence the prefrontal cortex either directly or within a few synapses. Additionally, the primate prefrontal cortex is highly granular and interconnected, whereas all other mammals have a prefrontal cortex that accounts for a considerably smaller percentage of brain area, and is largely agranular, or smooth. Because of the complex interconnections of the prefrontal cortex, most neuroscientists held the belief that it was too complex to ever fully understand. Furthermore, most underestimated the importance of the prefrontal cortex to human intelligence and behavior. Goldman-Rakic, however, understood early on that the unique nature of the prefrontal cortex in the higher primates perhaps held the key to understanding the biology behind the human mind, and she was not afraid to take on the seemingly impossible. As interesting and influential as the visual system research was, I was never attracted to it. I was captivated by the opportunity to study the unexplored frontal lobe and was especially intrigued by the challenge of understanding its relation to higher cortical functions. It never occurred to me to be concerned with the complexity of the frontal lobes – I never thought of it as an obstacle; rather, it’s an attractive feature of the subject. In 1979 Patricia married Dr. Pasko Rakic, a neurobiologist at Yale University. Shortly thereafter she joined Rakic at Yale, where the two established a research team to study the function and development of the prefrontal cortex, and founded the journal Cerebral Cortex. …Pat’s laboratory went on to produce the largest body of evidence that illustrated a conserved organization of the neocortex, extending well beyond visual and other primary sensory systems to the frontal lobe, with parallel streams of information flowing across cortical areas, as well as subcortically via the basal ganglia to effector systems. Goldman-Rakic’s work on the neocortex, as well as her work on the prefrontal cortex, changed and shaped the way scientists study and understand the human brain. Everything that is done today regarding comprehension of brain functioning is a result of Goldman-Rakic's revolutionary and tireless efforts. 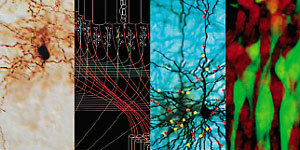 In the 1990s Goldman-Rakic shifted her attention to understanding the regional and subcellular organization of neurotransmitter systems, particularly dopamine system. The result of her work with neurotransmitters has led to a deeper understanding of neurobiological disorders, including schizophrenia, Alzheimer’s, Attention Deficit Disorder, cerebral palsy, Parkinson’s, and dementia, and will undoubtedly continue to contribute to the development of medical treatments—and perhaps an eventual cure—for these disorders, as well as many others. 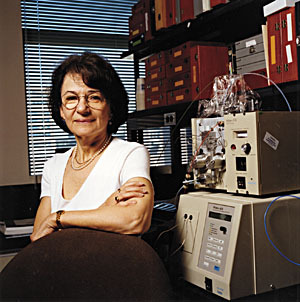 Goldman-Rakic published over 300 papers over the course of her career, and was elected to the National Academy of Sciences, the National Academy of the Arts and Sciences, and the Institute of Medicine. In 2001 CNN named her “America’s best neuroscientist,” and indeed, most, if not all, of her colleagues would agree. In 2003 Patricia Goldman-Rakic’s life was tragically cut short, when she was killed in a car accident. As scientists continue to use her work to build a greater understanding of brain and mind, however, her name will continue to permeate through the scientific community. Furthermore, her place as the preeminent neuroscientist- not simply the preeminent female neuroscientist, but the preeminent neuroscientist- of the recent times, will continue to inspire young female scientists to carry on the great work that she started. Arnsten, Amy. "Patricia Goldman-Rakic: A Rememberance," Neuron, October 30, 2003. Kevles, Bettyann H. and Schechter, Geraldine P. "The Biology of Memory: Patricia Shoer Goldman-Rakic '59 (1937-2003)," Vassar Quaterly, Winter, 2004. Levitt, Pat. "Patricia Goldman-Rakic: The quintessential multidisciplinary scientist," Public Library of Science, November, 2003.